Kappel, Frank. "Cherry". The Canadian Encyclopedia, 18 March 2019, Historica Canada. https://www.thecanadianencyclopedia.ca/en/article/cherry. Accessed 18 April 2019. Cherry is the common name for certain members of genus Prunus of the rose family, which produce small, fleshy, single-stoned fruits. Sweetheart cherries (courtesy Frank Kappel). 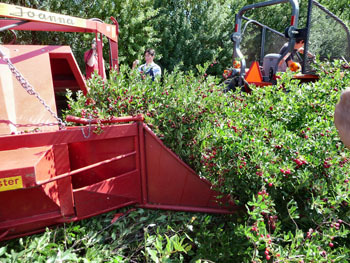 Harvesting sweet cherries in the Okanagan Valley, BC (courtesy Mélanie Fafard). Sweetheart cherry tree block at H&R Orchard in Creston, BC (courtesy Mélanie Fafard). 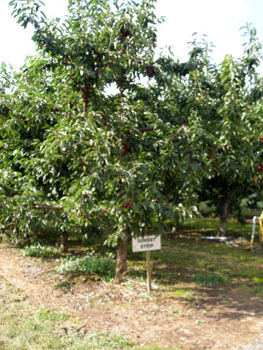 Sour cherries are harvested mechanically. Here, they are entering the mechanical harvester (courtesy Bob Mason). 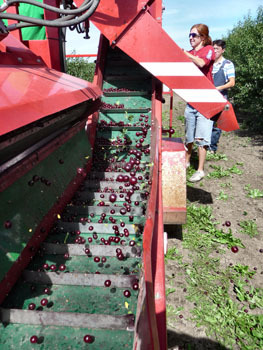 Sour cherries fall onto the collection belt (courtesy Bob Mason). Cherry is the common name for certain members of genus Prunus of the rose family, which produce small, fleshy, single-stoned fruits. It is now generally accepted that the two species of cherries in world trade are P. avium (sweet cherry) and P. cerasus (sour cherry). 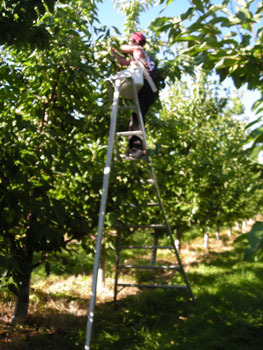 Over 90 per cent of the production of sweet cherries is in southern British Columbia (Okanagan, Similkameen and Creston Valleys) and the remaining in southern Ontario (predominately in the Niagara Peninsula). Cherry trees are tall, with reddish-brown bark, large tapered leaves, white blossoms and black, red or yellow, round or heart-shaped fruit. Cherries require a warm growing period with minimal rain during the fruit ripening period, especially for sweet cherries, to reduce the amount of rain-induced fruit cracking. 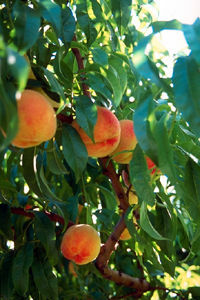 Cherries also need a cool period to allow trees to meet their chilling requirement to ensure bud break in the spring. 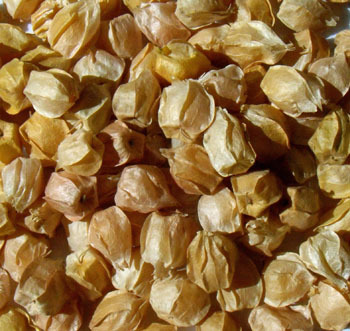 It has been suggested that the sour cherry originated as a hybrid between the ground cherry and sweet cherry. Sweet cherries are native to Europe and western Asia; sour cherries, to Asia Minor. 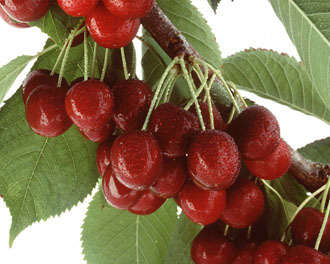 The spread of both sweet and sour cherries from the centres of origin was accomplished by animals, birds and humans. Theophrastus was the first of the Greek writers to mention cherries, about 300 years before the Common era. Pliny the Elder (23 - 79 CE), the Roman encyclopedist and author of Natural History, suggested that the Roman general Lucullus brought cherries back to Italy when he returned from the Pontus region in Turkey. 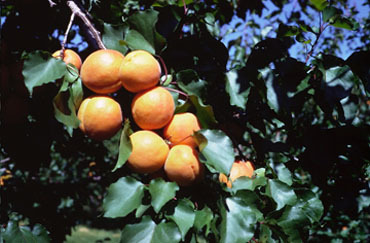 Sweet cherry trees and fruit buds are sensitive to winter frosts; blossoms, to spring frosts; and the fruit is susceptible to rain-induced cracking and to rot. Until recently all cultivars of sweet cherries were self-sterile and required selected pollenizers (i.e., another plant source of pollen). 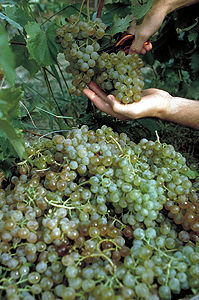 Self-fertile cultivars have been developed and are now being grown commercially. The main sweet cherry cultivars are Lapin, Sweetheart, Staccato, Van and Hedelfingen; sour cherry, Montmorency. Hardy prairie varieties include Evans and SK Carmine Jewel. Cherry fruit is flavourful and rich in minerals, organic acids, riboflavin, niacin and antioxidants. Sweet cherries are chiefly produced for the fresh market, whereas sour cherries are largely processed. Cherries are frozen in bulk or individually quick-frozen and can be further processed. Canned sweet cherries are primarily consumed as a substitute for fresh fruit whereas sour cherries are used for pie fillings. Dried sweet or sour cherries are used as is, included in dried fruit and nut mixes or enrobed in chocolate. Jams and jellies are other processed cherry products manufactured from whole or crushed fruit (sweet or sour). Maraschino, glace and candied cherries are sweet cherry fruit that has been bleached, re-coloured, and sweetened in sucrose solutions to be used as garnishes for drinks and desserts. 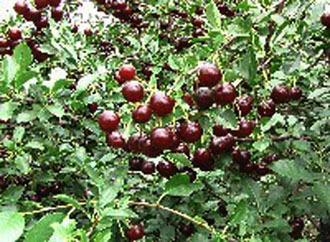 Cherry fruit is also used for juice, nectar, liqueurs and wines.